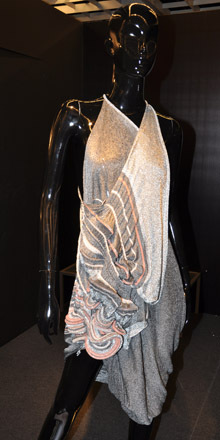 Soojin Kang, a student in the MFA Fashion Design and Society program, was the winner of the second annual “Feel the Yarn” competition, which was announced at the 69th Pitti Immagine Filati, the premier trade event for the yarn industry, which took place in Florence, July 5-7, 2011. Feel the Yarn is a competition for students at the top fashion design schools in the world that is intended to expand their knowledge of knitwear design, and more specifically high-end yarns produced by some of the top spinning mills in Tuscany. It was open to students in the MFA program at Parsons, as well as students at Central Saint Martins and the Royal College of Art in London, Bunka Fashion College in Japan, the Beijing Institute of Fashion Technology in China, Polimoda in Italy, and Senac Sao Paulo in Brazil. Sponsored by Toscana Promozione and the Italian Trade Commission in cooperation with Consorzio Promozione Filati and Pitti Immagine, the competition launched in March, when 21 designers nominated by their schools came to Tuscany to learn more about the design and production of knitwear yarn, and to visit some of the most acclaimed artisans in the field. Following the trip, each of the students designed and produced three garments using yarns from the participating spinners. These works were exhibited at Pitti Immagine Filati, and were reviewed by both a technical jury and the public at large to determine the winning designer.